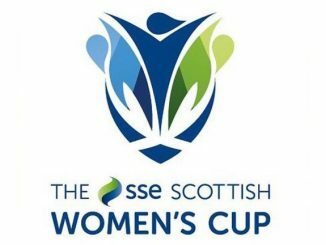 Hibernian ease into the SSE Scottish Cup quarter-finals, while Glasgow City replace them as leaders of the Scottish Building Society SWPL 1. Hibernian will host Glasgow Girls in the SSE Scottish Cup quarter-finals next Sunday after thrashing Celtic 5-0. Abi Harrison sent a looping header over keeper Megan Cunningham to put Hibs 1-0 up and Joelle Murray doubled the lead when curling home a free kick. In a four-minute spell leading up to the break, Murray headed in the third and Harrison volleyed against the bar, before a break ended with the latter also scoring again. Moments after the restart, Lisa Robertson completed the scoring with a header. Glasgow City replaced Hibs as SWPL 1 leaders after their 3-0 victory over Hamilton Academical. 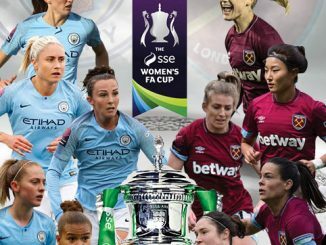 City took only 3 minutes to score, as a Katie McCabe cross was hit in by Lauren McMurchie, with the aid of a deflection. McMurchie got her second on 21 minutes, turning in a Leanne Ross delivery at the back post. Abbi Grant hit the Celtic woodwork after the interval but Ross added the third from a penalty. Stirling University slip to fourth on goal-difference after being held 1-1 by Rangers. 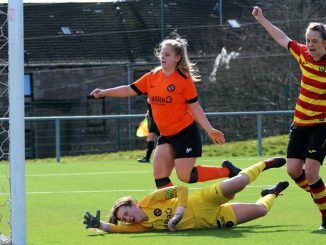 Goalless going into the last minute, Stirling seemed to have won it when Nicole Pullar scored but Lauren Davidson responded with a last-minute equaliser. Spartans climbed into third place after a 2-1 victory away at basement side Aberdeen. Leading 1-0 at half-time, Alana Marshall doubled the visitors advantage on 51 minutes, with the Dons pulling a goal back in the dying minutes. Third-placed Glasgow Girls took on SWPL 2 leaders Forfar Farmington but slipped to a 1-0 loss. Danni McGinley latched onto a long ball to slot home 6 minutes before the break, as the title favourites extended their lead. 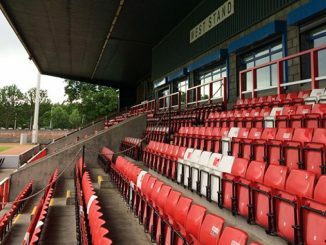 Jeanfield Swifts hosted Hearts in a mid-table meet and their 3-1 result saw them leapfrog their visitors into fourth spot. Laura Dunn converted a penalty and Eilidh McIntyre made it 2-0, with Ashley Carse halving the deficit but Ellie Cowie quickly restoring the two-goal cushion. Buchan went down 3-1 at home to Edinburgh Unversity Hutchison Vale. Anna Hume, Leanne Forker and Beth MacLeod had Vale three up at the interval, with the hosts later getting a consolation. Hibs ladies beat Celtic? Did they rest the likes of brown and Griffiths?